Wall Street Journal and BusinessWeek bestseller Asked to explain why a few people truly excel, most people offer one of two answers. The first is hard work. Yet we all know plenty of hard workers who have been doing the same job for years or decades without becoming great. The other possibility is that the elite possess an innate talent for excelling in their field. We assume that Mozart was born with an astounding gift for music, and Warren Buffett carries a gene for brilliant investing. The trouble is, scientific evidence doesn't support the notion that specific natural talents make great performers. According to distinguished journalist Geoff Colvin, both the hard work and natural talent camps are wrong. What really makes the difference is a highly specific kind of effort-"deliberate practice"-that few of us pursue when we're practicing golf or piano or stockpicking. 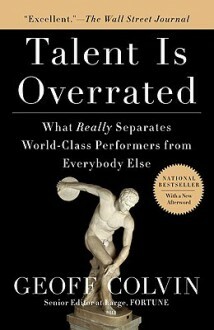 Based on scientific research, Talent is Overrated shares the secrets of extraordinary performance and shows how to apply these principles. It features the stories of people who achieved world-class greatness through deliberate practice-including Benjamin Franklin, comedian Chris Rock, football star Jerry Rice, and top CEOs Jeffrey Immelt and Steven Ballmer. And the book is overrated too.